Providing digital measurements of both electric and magnetic fields, with audible sounder. 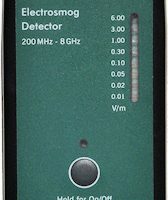 The EMFields ELF Meter measures Electromagnetic Fields (EMFs) produced near powerlines, substations and transformers, building wiring & electrical appliances. It provides digital precision with a wide measurement range, and includes a sounder for an audible indication of field intensity/- strength. Most importantly, it is the easiest digital monitor to use and understand! 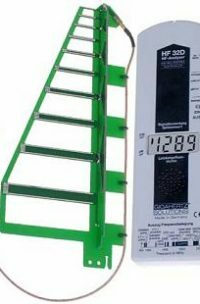 From ELF electrical sources operating between 10-2000Hz, it provides magnetic field measurements between 0-19.99 microtesla, and electric field measurements between 0-1999 volts per metre. Uses a standard 9V battery, included. Two-year warranty.